A new study led by researchers at The University of Texas MD Anderson Cancer Center has uncovered genetic mutations that could potentially fuel early cancer growth in precancerous colorectal tissue from high-risk patients. This is the first study to use whole-exome sequencing (WES) to characterize genetic changes in precancerous polyps and in nearby tissue that has not yet transformed into polyps. 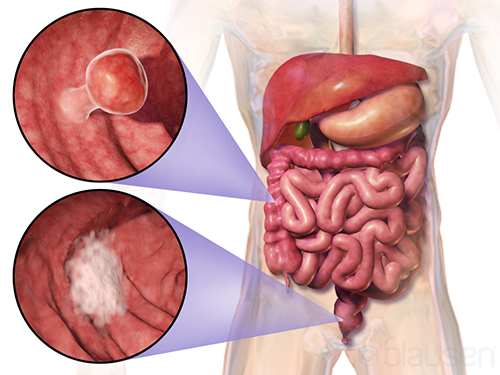 In addition to mutations at very early stages of cancer development, the findings identify potential drug targets for colorectal cancer (CRC) prevention. While most of the genetic changes present in advanced CRC are known, those occurring before cancer develops have remained elusive. To identify the earliest mutations, the research team studied polyps and nearby colorectal tissue, or mucosa, from patients with FAP, a hereditary cancer syndrome caused by an inherited mutation in the APC gene. APC mutations are responsible for 80% of CRC cases, making FAP a particularly attractive model for studying CRC development. Although responsible for only 1% of all diagnoses, patients with FAP have a 100% lifetime risk of developing CRC without preventive actions. The investigators characterized genetic changes in polyps and adjacent mucosa, which, despite appearing normal, is considered “at-risk” tissue. WES was performed on 25 colorectal polyps, 10 adjacent mucosa, and 12 blood samples from 12 patients with FAP. The research team identified 2314 genetic changes in polyps, with an average of 83 mutations per polyp and an average rate of 1.75 mutations per megabase, or 1 million DNA bases. In adjacent mucosa, the researchers discovered 279 alterations, with an average of 27 mutations per sample and an average rate of 0.49 mutations per megabase. Many of the mutations seemed to cluster together around genes that work in tandem for cell-signaling networks. Members of one network called the Wnt signaling pathway, which includes the APC gene, appears to be especially important for the transformation of mucosa to polyps. “Wnt is the dominant driver for these types of polyps at a very early stage. It is completely central to the development of premalignancy in colorectal cancer, and targeting Wnt should be a priority for chemoprevention,” noted Dr. Vilar-Sanchez. After studying the mutations identified in these samples, the research team found at least 23% of mutations in the polyps already were present in the at-risk mucosa. A further comparison between polyps and Stage I cancers from The Cancer Genome Atlas (TCGA) revealed greater similarity between premalignant and cancerous tissue than expected.